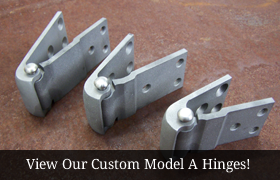 At Model A Hinges we are proud to be one of the few producers and distributors of custom Model A Hinges! Using state of the art equipment and the latest technology, we can provide hinges that are worthy of the project you have dedicated your time and efforts to produce. We invite you to browse through our store and shop with confidence, and if you have any questions don't hesitate contacting us! Custom Model A Hinges & More! After realizing the lack of quality solid steel Model A door hinges on the market today, we saw a need to provide them. Taking original stock hinges from a variety of 1928 – 1931 Model A body styles, we reverse-engineered, prototyped, machined, and now manufacture them for retail. Our Model A hinges are machined out of solid steel, with oilite bushings, stainless steel hinge pins, and with all holes pre-drilled for mounting for the best durability and to ensure proper mounting. Offering the greatest selection of models, complete sets, and door/cowl side only sets, we now supply owners and restoration shops across the US and internationally. These cars & trucks come with highly detailed interiors. For the collector car enthusiasts, hot-rodders, and custom car builders, who takes the time and effort to bring these cars to life, having functional door hinges, allows you to display your restoration project with as much flair as you wish. Using state of the art equipment and the latest technology, we can provide hinges that are worthy of the project you have dedicated your time and efforts to produce. Contact us today by calling (612) 770-4805. Copyright © 2010-2017. Model A Hinges All rights reserved.